Rehabilitation of tropical forests needs a good understanding of basic characteristics of indigenous tree species. The Asia-Pacific region is biologically very diverse, however, the genus Shorea is extremely important of over one hundred eighty species of very large tropical tree up to 70 m tall with the fruit a single-seeded winged nut. 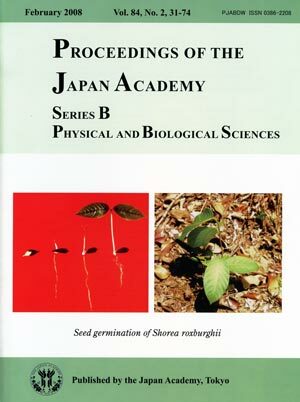 Among them, the Shorea roxburghii is the hypogeal germination species. The paired cotyledons stay under the seed coat, and they do not expand during the germination. 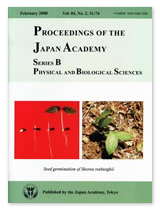 The resinous seed coat protects from desiccation. The first paired leaves develop on the epicotyl, and they are the first photosynthetic organs of the seedling(the left photograph). The seed of S. roxburghii germinates on the naked ground, as the hypogeal seed keep the moisture under the seed coat. The trees of S. roxburghii are able to grow on the dry sand dune, and expand the woodlot by germinating the seeds disseminated from the trees(the right photograph). In addition, the trees of S. roxburghii show the tolerance to the forest fire as well as the tolerance to the acid sulfate soil. Thus, new techniques in re/afforestation of tropical forests in the Asia-Pacific region are exploited by a better understanding of nature of indigenous tree species.